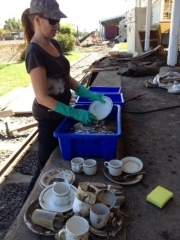 One of the victims of the widespread devastation during the Australia Day Floods in Bundaberg, was the Bundaberg Railway Museum. After months of hard work by volunteers and the local community, they have set a date for the reopening of the Museum for the 28th September 2013. They plan to have an open day from 10.00 am until 3 pm, with a sausage sizzle from 10.am until 1 pm. To Help fundraising efforts there is a raffle of a Bull Signed Cricket Bat (donated by from QR) and also 3 family passes for the Ipswich Workshops (donated by the workshops) at $1.00 a ticket. There will also a miniature train set up containing models of QR loco’s and other rollingstock. ATRQ urges as many of our groups to attend this reopening and give the lads a bit of moral support, to get this unique operation going again after the trauma they have had to go through. A likely activity at the completion of the event would be that attending members of ATRQ will go for a few cleansing ales and dinner on the Saturday evening. If you’d like to join us let Peter Ford know ASAP. If we could get an indication of numbers by the 20th September, we can let them know so they will have enough sausages etc. You will have to organise your own accommodation etc.